We created this page to quickly answer your questions, any time. If you don’t find an answer here please contact us. We are happy to help you in any way we can. 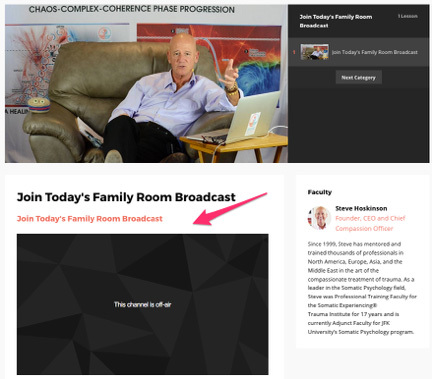 How do I watch the Family Room Broadcast? Scroll down and the live event will be waiting for you. The minimum viable connection speed to stream video reliably is about 768 kilobits per second (equal to 0.768 megabits per second). We recommend a connection speed of at least 5 Mb (megabits) per second for an optimal experience with HD capability. You can test your download speed using speedtest.net. Please contact your internet provider if your download speed is problematic. How do I ask a Question during the Broadcast? 3. Refresh your browser to check for responses to your question. How do I ask a Question by Video, which will be part of the broadcast? A. First, make sure you have a Skype account and Skype installed on your computer. 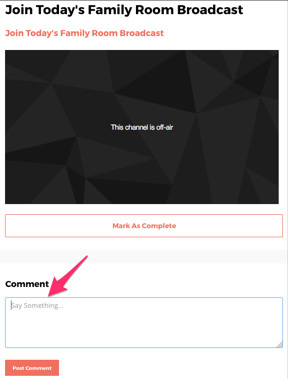 C. While watching the webcast in the OI Virtual Classroom, use the chat box underneath the video stream to post your request for a question by video; include your Skype name. D. Steve may call you via Skype and invite you into the webcast to ask the question in person. – when you are done with the Skype call, un-mute the live stream and continue watching from there. How can I update or change my credit card info before it expires? If you want to change your password: open your Virtual Classroom. On top, next to “OI Website,” you will see a circle that is the access point to your personal information. Click on the circle and select “Settings” from the dropdown menu. On the page that opens up enter your new password. 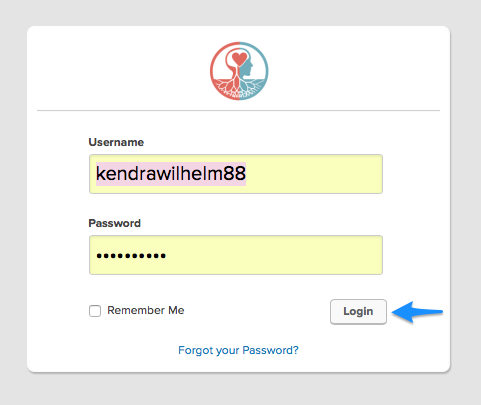 If you are locked out of the Virtual Classroom and you forgot your password: open Virtual Classroom. Click on I forgot my password. And follow the instructions. Can I suspend, then reactivate my membership? We are happy to help you with an upgrade. You can upgrade your membership anytime by emailing Tashia at tashia@organicintelligence.org. Please include a brief description of your current membership and the desired upgrade. 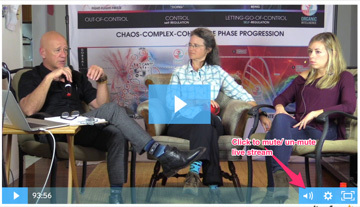 Why can’t I see other training levels in the OI Virtual Classroom? If you cannot view a section in your OI Virtual Classroom, it is because they are not included in your membership level. For example, as an OI Basics member you won’t be able to access OI Expert membership content. If you’d like to upgrade your membership, please email Tashia at tashia@organicintelligence.org. You can cancel at any time by emailing tashia@organicintelligence.org. Please read our cancellation policy for more information. Use this link to cancel OI Basics membership. Our cancellation policy applies. We love it when you refer others! If you are an OI Basics, HEARTraining® or OI Expert member you may qualify for commissions as a Referring Partner. 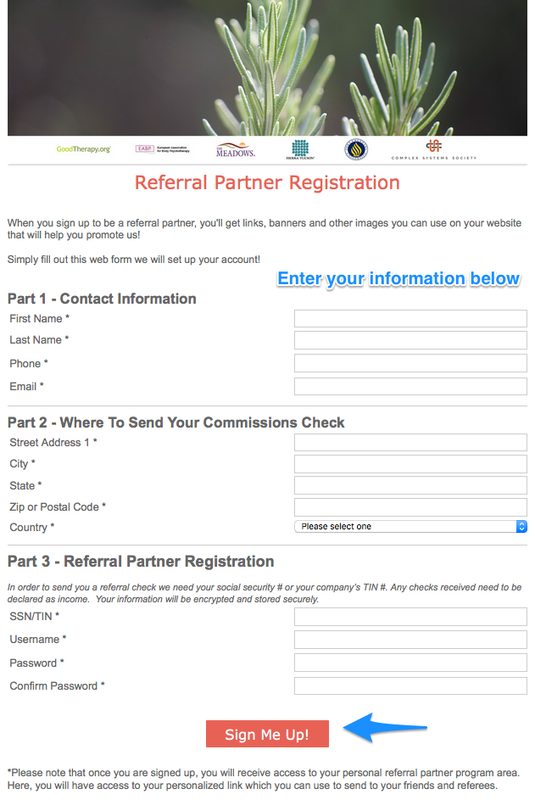 Please see our Referral Partner page for more details, and how to sign up. Organic Intelligence® online credit card processing is secured through VeriSign, PayPal and/or Authorize.net. For your security all credit card information is encrypted. We do not keep your credit card information on our servers. If this doesn’t work please email Tashia at tashia@organicintelligence.org with detailed information on what the issue is. Please email Tashia at tashia@organicintelligence.org with detailed information: please let us know what video is affected, and what issues you are experiencing. Are OI Expert audio files downloadable? Yes, all OI Expert audio files are downloadable to your mobile device. 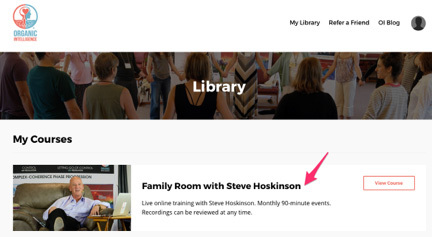 Log in to your OI Virtual Classroom, go to the video file, the respective audio file will be available for download in the sidebar on the right. When my membership expires, will I still have access to audio or video files? If you are an OI Basics member your access expires with your membership. 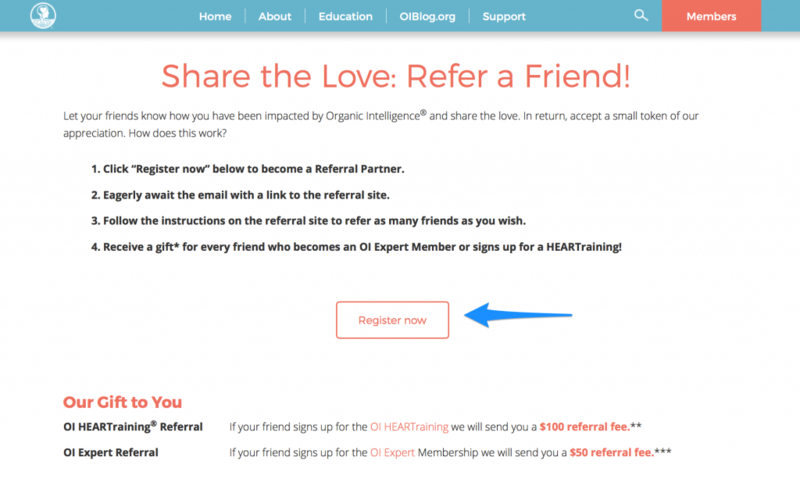 You can renew your membership by emailing Tashia at tashia@organicintelligence.org. If you purchased one OI Expert Master Class you will have 6 months access. If you purchased the bundle of all 7 OI Expert master Classes you will have 2 years access. All members are now set up as recurring subscriptions; your membership will automatically renew until you decide to cancel. 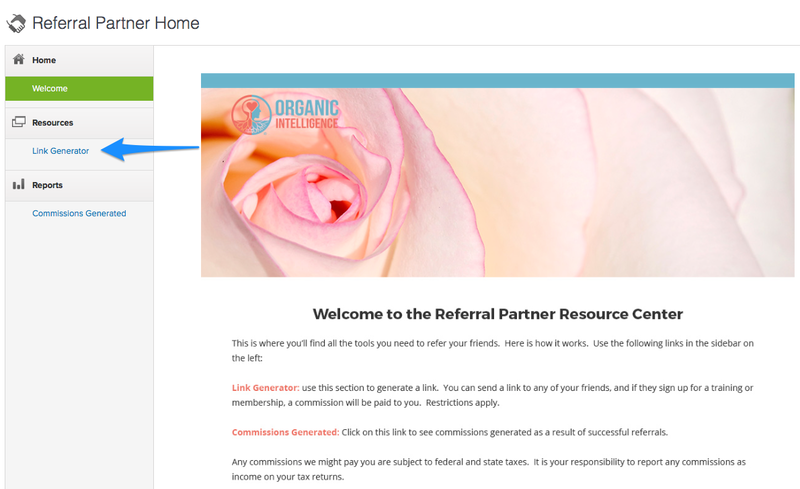 If you cancelled a membership, and you would like to reactivate it, please email Tashia at tashia@organicintelligence.org. Why is the HEARTraining residential? One of the core elements of the HEARTraining and its inherent success is the residential retreat setting. Based on Steve’s direct experience with teaching thousands of students around the world, this is where the magic happens. The power of the residential setting is that it creates a unique life experience, of special value to both students and mentors. It has added so much to the learning process, and contributed so significantly to the development of the students, that we’re humbled by it. The residential nature of the HEARTraining is what allows for the emergence of a supportive community, from a container of trust and compassion. Students and mentors are profoundly nurtured by the ease and acceptance as our mindful path unfolds in a heart-oriented way. If I live nearby, do I need to pay a commuter fee? If you live nearby, and the Full Residence experience is not possible, we do have a Commuter option, and we do charge a commuter fee, which includes lunch, dinner, snacks, & facilities fee. To support the residential nature of our trainings you will be able to enjoy meals together with your new OI friends and OI staff. The conversations, getting to know one another on a human level is very healing in itself — and is part of the OI retreat experience our students come to cherish. One of the core elements of the HEARTraining, and its inherent success, is the residential retreat setting. Based on Steve’s direct experience with teaching thousands of students around the world, this is where the magic happens. We wish this experience for everyone. Can I transfer from one HEARTraining to another? Yes, transfers are available with certain restrictions. Please see our Sales, Cancellation, Refund and Transfer Policy for detailed information. It is strongly recommended that you complete the training in the same location and with the group where you started. The community support you will receive and the coherence of group continuity is an essential element of the residential trainings. And, we understand that life happens. If you need to change training locations please make your request for transfer at least 30 days prior to a training start date. Please consult with your mentor to process the consideration of transfer. If a request for transfer is granted your current mentor will assist in assignment of a new mentor in the new location. Transfer requests can be made in writing by emailing Tashia at tashia@organicintelligence.org. Can I take HEARTraining retreats by video? If you need to miss all or part of one Residential Retreat it is possible to catch up with video and work through the missed exercises with the oversight of your assigned Mentor. Full tuition applies, plus any additional fees that may be charged by the Mentor assigned to you. While it’s not ideal for your own professional and personal development, you may take HEART Retreats 1 and 2 by video and join the journey live in HEART Retreat 3. Paid consultation and remediation may be required. Retreat 6 cannot be taken by video. If you cannot attend Retreat 6 in your initial location, you can attend in another location at least one month after completing Retreat 5. How can I inform you of any health issues before attending HEARTraining? We really appreciate if you let us know in advance. To notify our office, please contact Tashia at +1 (760) 634-3691, or email tashia@organicintelligence.org with specific information about your condition. For more information, please read our Health Policy. Can I get a refund for the HEARTraining? Yes, we are happy to refund your tuition if you are not able to continue, or unhappy with the training. Certain restrictions apply. Please read our Sales, Cancellation, Refund and Transfer Policy for detailed information. What is your policy for missing a HEARTraining retreat due to health issues? First of all, we are sorry to hear that you may have to miss a retreat due to health issues. We wish you betterment and healing. If you have to miss a live HEARTraining retreat due to a serious health condition or pregnancy you have the option to make up for the missed retreat by video with the help of a personal mentor. For details please see our Sales, Cancellation, Refund and Transfer Policy, section “Transfers.” Some restrictions apply. Can I take a leave of absence from the HEARTraining? Any student can take a leave of absence for a maximum period of two years. You may continue the training in another location. If your leave of absence exceeds a period of two years the last retreat you attended will need to be retaken, either in person or by video. We are happy to assist you with this process. Please contact Tashia at +1 (760) 634-3691, or tashia@organicintelligence.org. Would I receive CE Credit when I miss part of a residential training module? Our CE partner organizations require in-person attendance of all contact hours at each live training or workshop to qualify for CE Credit. Unfortunately partial credit is not awarded. For detailed information visit the HEARTraining CE Credits page or the workshop pages. 4. Check your email inbox for log-in instructions and your username and password. 5. 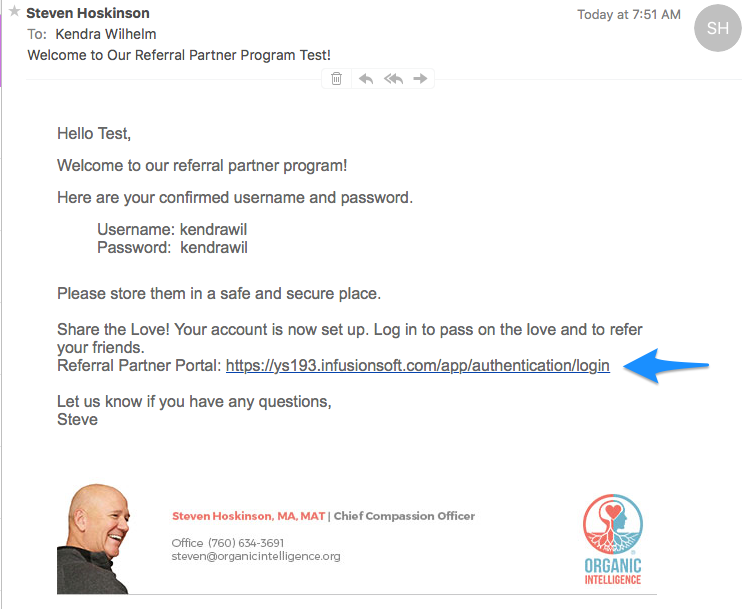 Click on the link in your email to login to your Referral Partner Center. 7. 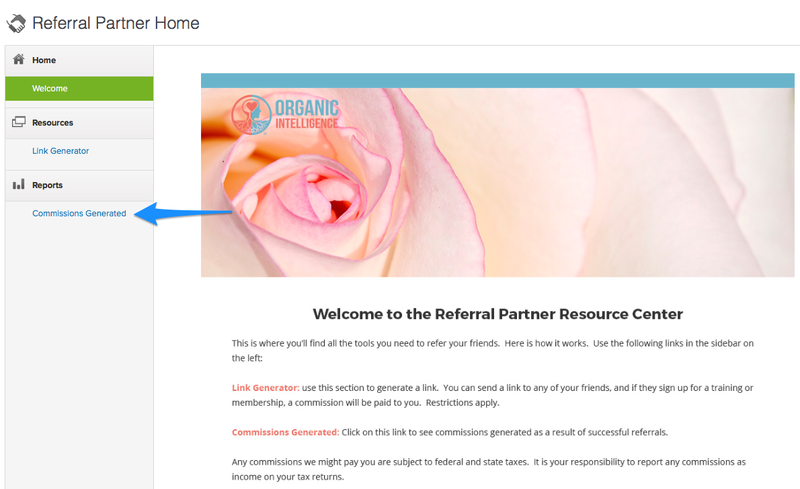 To send a friend a referral request to sign up, click on the “Link Generator”. From here, copy and paste either your OI HEART referral link or your OI Expert referral link. This is the link you will send to anyone you want to refer. 9. 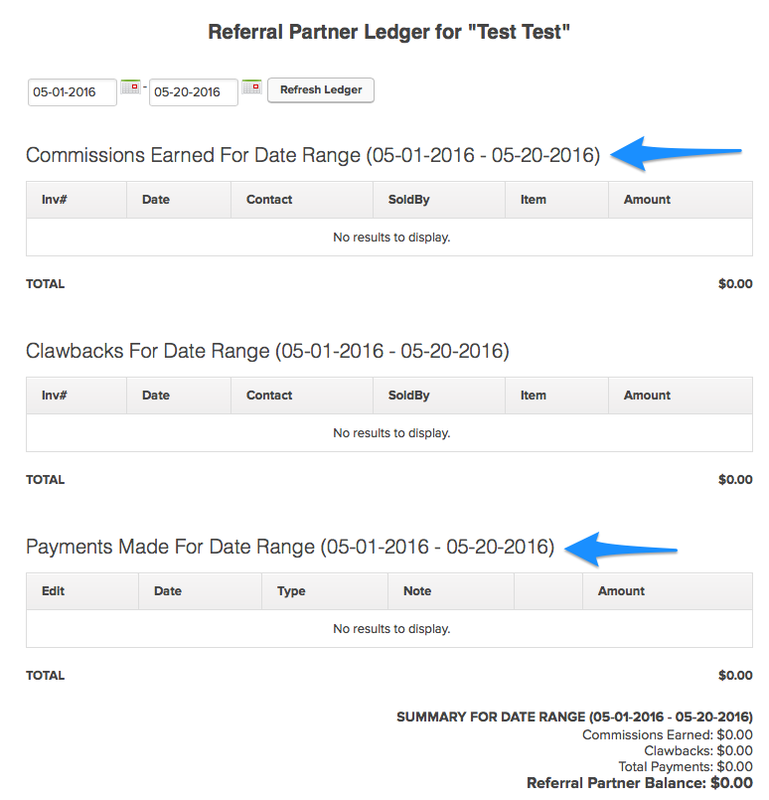 To see your commissions click on the “Commissions Generated” report. Set the date range and push View Ledger. Make sure the date range is at-least a month or two back. In a pop-up window, your Ledger will show with total commissions earned, as well as total payments made to you for your referrals. Can I use OI Graphics on my website, or distribute them? The OI Graphics are the product of years of research, clinical practice and classroom experimentation. They were developed by Steve Hoskinson, and are protected under international copyright law. If you want permission to use Steve’s graphics, please make such a request for permission in writing; email Tashia at tashia@organicintelligence.org and include an image of the graphics and your intended use. Do you sell email addresses to other companies? The minimum viable connection speed to stream video reliably is about 768 kilobits per second (equal to .768 megabits per second). We recommend a connection speed of at least 5 megabits per second for an optimal experience with HD capability. You can test your download speed using speedtest.net. Please contact your internet provider if your download speed is problematic. Our video will work on any browser that supports Adobe Flash and/or HTML5 (in the form of MP4 video with and h.264). The requirement for viewing Flash content is Flash Player 9 or greater, and a browser that supports Flash. To check which version of Flash you are running, head to Adobe’s download page. To ensure the best playback, we typically recommend remaining up to date with your Flash version whenever possible. Sometimes viewing problems can be browser specific. Try using a different browser, such as Safari, Firefox or Chrome. In your preferences pane, make sure under “privacy” that you allow cookies from sites you visit. Sometimes ad blockers or popup blockers interfere with the connection to the OI Virtual Classroom. If you have difficulty maintaining access, try turning off the ad blockers and popup blockers under “security” in your preferences pane. If you continue to have issues please email us at tech@organicintelligence.org.